RABO Tricycles' quality is unsurpassed and superior within the industry. The materials used in RABO Tricycles are of the highest possible quality. Ergonomic scale and proper anthropometrical dimensions of all materials meet stringent quality and production specification standards. This guarantees the least amount of maintenance along with a long lifetime in the most demanding institutional and public settings around the world. For at bevare RABO cyklers høje kvalitet og udseende og forhindre korrosion specielt i varme og fugtige omgivelser er stellet grundmalet og derefter pulver-coatet i den klare gule RABO-farve. RABO cyklers stel er - i modsætning til andre producenters stel - konstrueret og fremstillet af løbende, hele rør, hvilket giver øget holdbarhed. Significant sharpening of colour category boundaries occurs in early childhood, after which category boundary width remains stable throughout the balance of the life span of a person. Furthermore, perceptual development in colour parallels development in speech perception. RABO Tricycles' careful choice of its yellow colour is a useful design element for way finding, spatial orientation, and contributes to added space definition in children's environments. 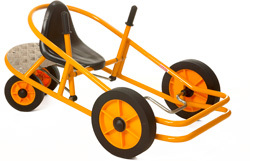 The colour yellow is in the category of fast moving colours, ensuring children's quickest possible recognition of a tricycle in use and motion. The yellow coloured tricycles are visually easily tracked by children, minimizing the risk of children running into a tricycle in motion.